Which of these foods were available to the California Indians when they first arrived here? There are two foods that were not native to California. Can you find them? As we learned about food chains and food webs, we saw once again that there certainly is a circle of life…from producer to consumer to decomposer. We started our vermicomposting bin last week. Our friends, the worms, are doing their business as we fed them vegetable and fruit scraps. We hope to see the “fruits”of their labor in a few months as they make rich dark soil. We will sample foods of the California Indians this week….berries, nuts, seeds, dried fish and dried meat. Besides learning that the California Indians were hunters and gatherers, what else have you learned about them? What other natural resources did they use? This entry was posted in Uncategorized by mscheung. Bookmark the permalink. They used spears to catch the deer. They had to catch the deer because they didn’t have stores to buy food. They had to catch their food with spears. They used nets to catch thier fish. Then they dried them. The California Indian’s food was acorn. We ate cornbread instead. We also ate beef jerky instead of deer jerky and had berries and tasty fish like salmon. The natural resources they used was stuff like wood, straw, rocks, flint, etc. California Indians were awesome because they hunted food like salmon, bears, and even moose.The Indians hunted them for shelter, clothes, and even food. We ate berries, dried fish, and dried meat. Californians were hunters and gatherers. The other things that we learned from them are that they ate acorns and use spears to fish. Todays snacks were California Indian foods. Well, at least some of the food. 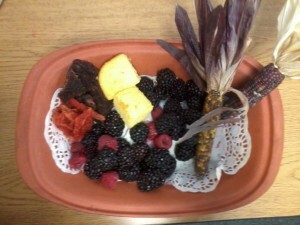 The berries were California Indians ate fish jerky and dried meat. I thought the berries were the best food. I didn’t like any of the jerky. I don’t know but I think they used spears and nets to catch fish. The foods that we tasted today were berries, meat, fish, and cornbread. Even though Indians did not have cornbread we ate it to replace acorn mush. They also gathered food for the winter. My favorite thing I learned about the Indians life was that they caught foxes for the fur. I tasted dried salmon. It was good. I had berries. They were sweet. I like to learn. California Native Americans use many resources to survive. They ate berries, nuts, dried meat, and other foods. Indians also used baskets to hold water for preparing. They used a grinding rock to grind acorns. Indians also used clothing for cold and stormy weather. California Indians wouldn’t be able to survive without these resources. California Native American had many resources like berries and nuts. They made sweat houses and round houses out of bark and dried grasses. They also used a special kind of rock called a grinding rock. The grinding rock was used for smashing acorns to make flour and acorn mush. They killed animals and dried them. Then they ate them, and with the skin they used for clothing in the fall and winter.